We are a motley crew heading to trek Kilimanjaro this July and bring some funds and supplies to the kids of Makuyuni Primary School in the Kilimanjaro region. 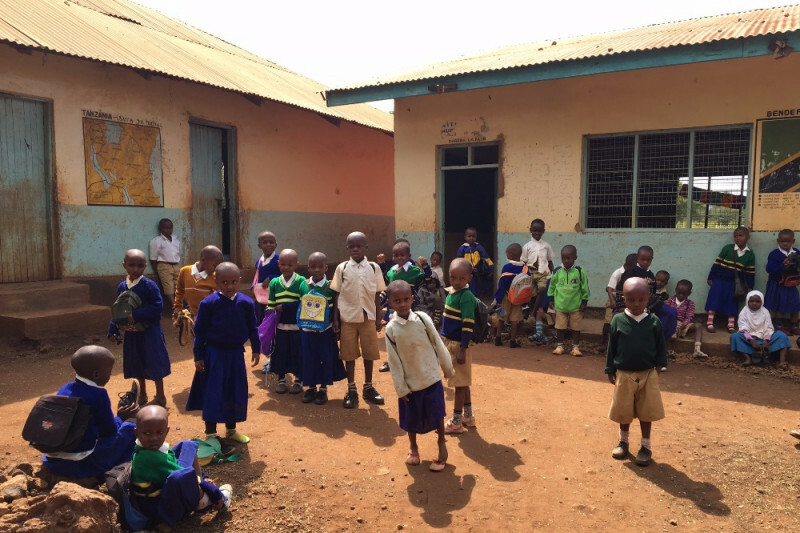 The school has 440 pupils who live in extreme poverty & are currently in dire straits due to a regional drought. Our aim is to fund one meal per day per child for half a a year. The cost of the food for the 440 pupils is currently 60,500TZS (roughly €25.60) per day for maize, beans and sugar. €4672 would ensure that each one of these kids were guaranteed ONE meal each a day for 6 months if we can raise this...or one full year if we could raise €9344...imagine! This would mean that the headmistress and teachers can get on with teaching the pupils as they are currently going for days on end with no food which is interfering with their education. PLEASE NOTE that each climber is funding 100% the cost of the trip & climb themselves so EVERY CENT (except GoFundME fees) raised is going straight to the headmistress of Makuyuni School. As part of the fundraising campaign, Jennifer, Catherine and Kirsten from Redlane Boutique are doing the Waterford Viking Marathon. If you've arrived here through a link from Redlane, you've come to the right place! You can donate here, NOTHING is too small. THE PRICE OF YOUR MORNING COFFEE WILL FEED NEARLY 50 KIDS FOR ONE DAY! 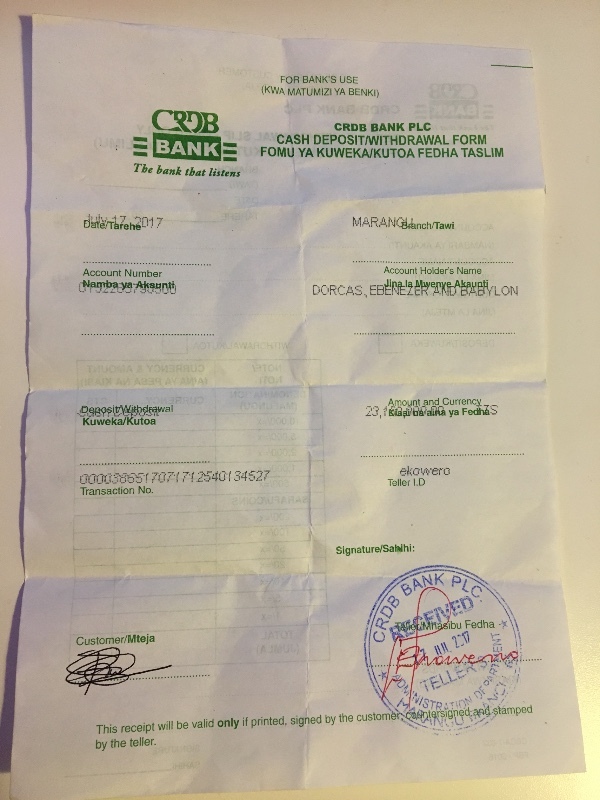 Just a note to let you know that the new bank account has been set up in Marangu to manage the fund that you all so generously donated towards. There are 3 signatures required to withdraw funds, Dorcas (school headmistress), Ebenezer (chairman of the school board) and Bobby (owner Babylon Lodge). Please see attached receipt for the first lodgement into the new account, the remainder is in transit as it only arrived after we had left Ireland, we'll post the receipt when we get it! Hi everyone, just got back today from an epic experience and very humbling to see the amount of support we received. Thank you so much for touching the hearts of these kids and giving them even the slightest hope that help is there for them to survive. Receipts and all evidence of spending will be posted on the page to show you exactly what your hard earned cash has provided for these kids. Thank you so much to each and every one of you for your generous donations...we've raised our goal to €6000...we can do this! Not only are you literally keeping children alive by supporting this cause - when Dorcas and her teachers receive this money, they can get on with teaching the pupils. With their basic human needs met, these kids can focus on educating themselves out of the cycle of poverty they have been trapped in. Children are children - local or Tanzanian - the same the world over. And every child deserves this. Thank you all for getting on board, we won't let you down!